LINFIELD COULD WELCOME Celtic to Belfast in mid-July if the Northern Irish club overcome La Fiorita of San Marino in the first round of Champions League qualification. This morning’s draw in Switzerland paired the clubs together to meet in the second qualifying round, though both teams have provisionally agreed not to play the prospective match on 12 July, which had been originally a potential date for the game. Should Linfield advance, the game could go ahead at Windsor Park on 11 July at 5pm to avoid a clash with the annual Orange Order marches set for the following day. Further details for the potential tie have yet to be confirmed, with the Police Service of Northern Ireland currently in discussions over the matter. We’ve also had a chat with Uefa and we had ruled out July 12 for obvious reasons, purely from a practical point of view,” Linfield chairman Roy McGivern told reporters. “Our preference is to play the home leg first, for financial reasons that’s obviously the best thing for us. At this stage the first-leg would be on 11 July, potentially with an early kick-off but there are discussions going on at home now with the PSNI to see how that would be managed. “That is the preferred option at the moment but there have been no discussions about switching the games at all. Linfield, who are managed by ex-Rangers and Northern Ireland striker David Healy, will open their campaign at home on 27/28 June and will travel to Montegiardino on 4/5 July for the return leg. Celtic automatically qualify for the second round having won the Scottish Premier League this season. In his first year in charge Brendan Rodgers led Celtic to the title by a margin of 30 points. 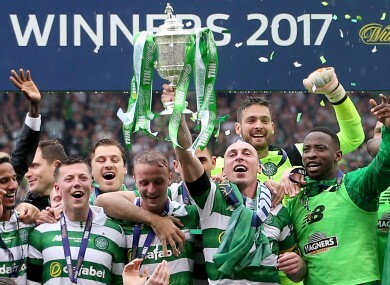 This achievement, coupled with the club winning the Scottish Cup and League Cup ensured a historic treble, while the Bhoys also qualified for the group stages of the Champions League in 2016/17. Rodgers, however, got off to a disappointing start 12 months ago when Celtic were beaten 1-0 by part-time Gibraltar club Lincoln Red Imps in July 2016. Celtic turned the tie around with a 3-0 win in Glasgow to make the third qualifying round, where they beat Astana 3-2 on aggregate. The Scottish champions beat Hapoel Be’er Sheva 5-4 in last year’s Champions League play-off to make the group stages, but they finished bottom of Group C with no wins, three draws and three losses. Elsewhere in today’s Champions League draw Dundalk will face Norwegian club Rosenborg in the second qualifying round, while in the Europa League first qualifying round all three League of Ireland clubs were all handed away days in their respective first legs. Derry City will travel to Denmark to face FC Midtjylland, while Shamrock Rovers face Icelandic club Stjarnan. League leaders Cork City will be satisfied with their tie as they face Levadia Talinn of Estonia. Email “Potential Linfield-Celtic Champions League clash would not be played on 12 July in Belfast”. Feedback on “Potential Linfield-Celtic Champions League clash would not be played on 12 July in Belfast”.